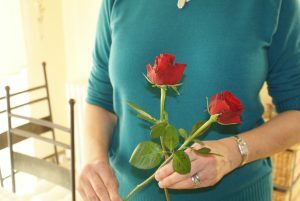 A lady came up to me at the end of my floral demonstration to the Wrington WI last week and thanked me for being reminded of something we all know – flowers make a truly memorable gift. 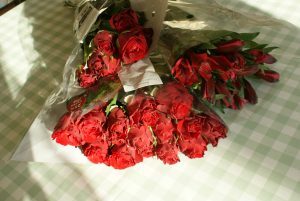 I’d said that I had read somewhere that 94 % of people surveyed remembered why and who gave them their last bunch of flowers. My reason why I always choose flowers over wine or chocolates for a gift is because I can pick the flowers which I know mean something special to that person. Nowadays supermarkets sell a good range so it’s easy to pick up a few bunches and by learning a few tips and techniques you can turn them into a gift you’ll be proud of. 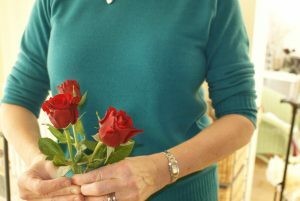 This first blog will give you an introduction to posy making with step by step instructions on how to make a simple single flower arrangement. 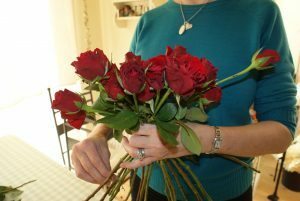 In the second blog I will guide you through how to add a collar of foliage to your bouquet and then take it a step further and create a mixed foliage arrangement. 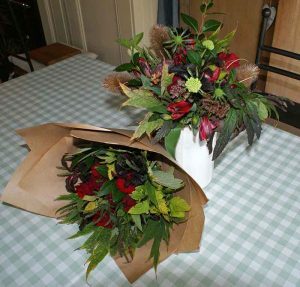 In the final blog I will show you how to make the most sophisticated bouquet of all – a mixed flower and foliage arrangement. 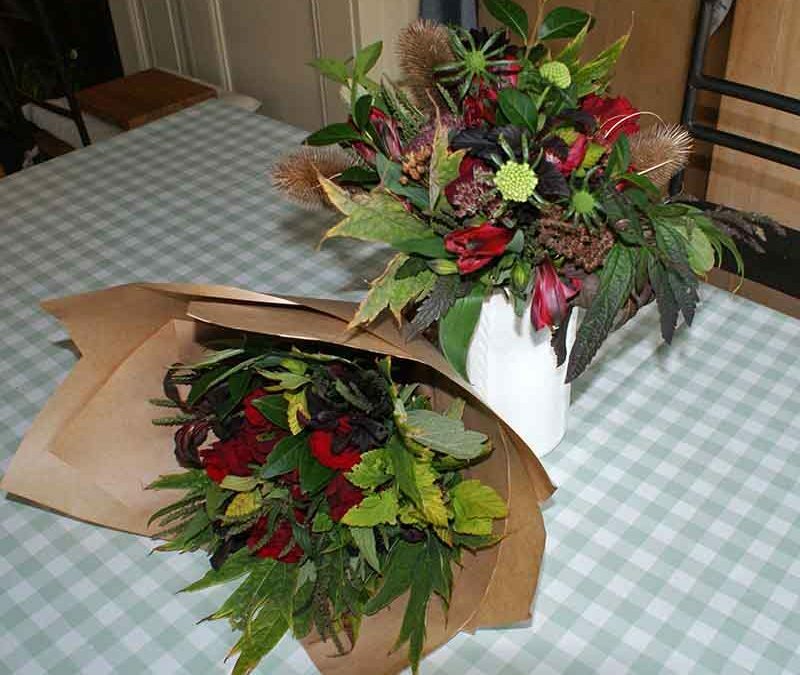 You’ll learn how to make all these bouquets at my posy making workshops which I run every season throughout the year. There you’ll get lots of guidance alongside hands on experience and plenty of time to master all the techniques. You are sure to take home some beautiful arrangements. You can find this years programme of workshops here. The first step is selection. 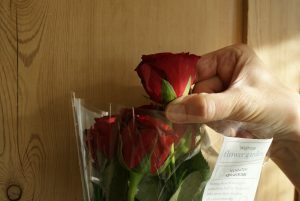 I advocate British grown flowers because you are supporting local producers, using less air miles and buying a seasonal crop; thankfully supermarkets are increasingly offering this option. 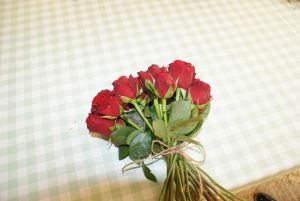 Roses are the best beginner’s flowers and when choosing them just squeeze the rose’s green base to make sure they aren’t soft. A few brown marks on the outer peals are ok as they can be peeled off as you would a vegetable but creasing on the outer edge of the petals cannot be removed. 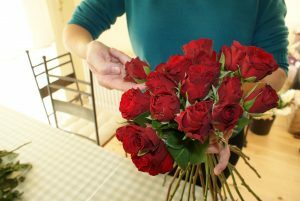 Also, some supermarkets offer either long or shorter stems, however unless they are going into a tall vase you are likely to be cutting off the extra length. 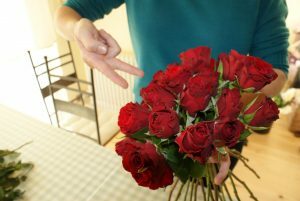 The second step is to condition your roses. 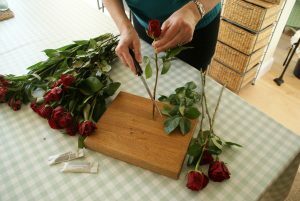 Strip any thorns by using a kitchen knife in a sharp downward swipe along the length of the stem, pull off all lower leaves but maybe leave just a few around the flower itself and then recut each stem by an inch. The third step is to create a spiral. 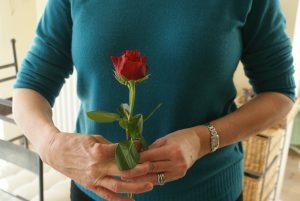 Start by holding the 1 st stem in line with your body – this is your holding hand. Then add the next stem at a 45 degree angle- this is your adding hand. 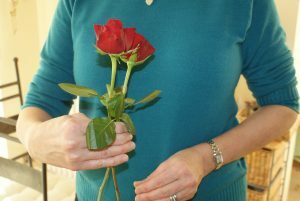 Finally lift the two stems out of your holding hand with your adding hand, turn in any direction and then drop both stems back in your holding hand. You are ready to add your next stem. 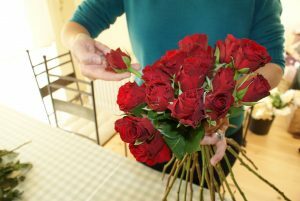 All stems must be added at a 45 degree angle AND always be put in the same place ie at the back OR front of the bunch of flowers PLUS each turn will always be either clock wise or counter clock wise. It is very important to be consistent. The amount of turn creates the composition so for a single colour it won’t make much difference but is key for a mixed arrangement. At this stage I suggest just getting all the stems into a spiral without worrying too much about how the flowers are looking. In fact it is the tippee shape you have created bellow your holding point which is more important than what is happening above your hand because it shows you have made a good spiral. 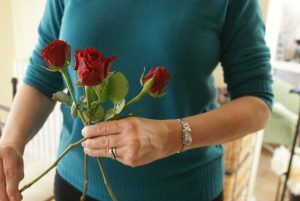 A good spiral means you can adjust any individual flowers without ruining the rest of the bouquet. 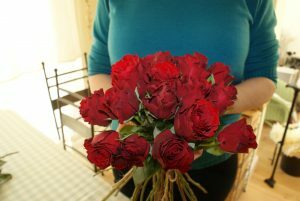 The fourth step is where you manipulate individual stems and create your dome shaped bouquet. 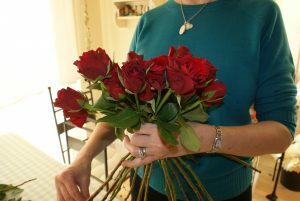 I find the first few stems of my bouquet have often dropped and created a dip in the middle of the bunch but you can easily lift them up again. 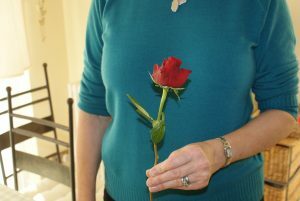 First create a v shape with your fingers and place it under the base of the rose, then hook it up to the height you desire. 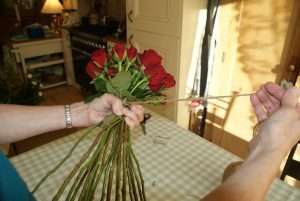 Alternately trace the stem you want to adjust down to the open end and pull it down from bellow. 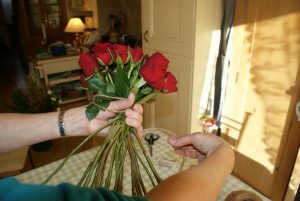 By carefully lifting up or pulling down particular stems you can adjust all the heights and make a dome. 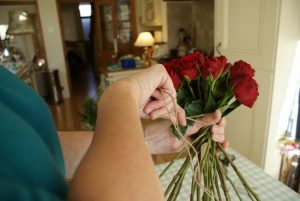 When you are pleased with the shape you’ve created then just tie off the stems with string at the holding point of the bunch. 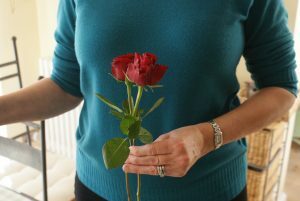 Next measure your bunch against the top of your chosen vase by lining up the string with the top of the vase. 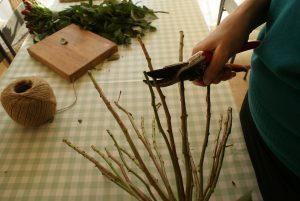 Cut the stems in a straight line and each individual stem at a 45 degree angle in order to increase water take up. Well done, you’ve made your first single colour knock out. I love this bouquet because it’s classic, elegant and so versatile. It can be made small and sweet to take along to a supper party or larger for a birthday present. The finishing touch is to wrap your flowers in brown paper. I have a really simple wrapping technique I use which I will feature in a forthcoming video. 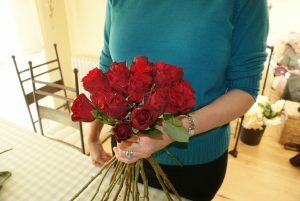 If the flowers are for an elderly person or a new mum I put the bouquet straight in a vase to make it is easy for them. Cheap vases are easy to get hold of and I have a few in a cupboard ready to use; they’ll think of you each time they refill it. I hope this blog has inspired you to have a go yourself at making a single colour knockout. Do send me pictures of your creations and let me know how you got on. If you have got the floral bug and want to try some other ideas the next blog will guide you through how to add a collar of foliage to your bouquet, create a mixed foliage arrangement and lastly how to make the most sophisticated bouquet of all – a mixed flower and foliage arrangement.